The warm weather is coming and that means our gardens are going to start blooming again; hurray! Along with all the beautiful plants and flowers there are some rather unwelcome visitors that we can expect to appear soon. Weeds aren’t just unsightly, they can kill off our other plants and even be dangerous for children and animals. Grab your gardening gloves and a trowel, as we list the 5 most common garden weeds and how to banish them. That pretty looking little yellow flower that we always seem to forget is a weed. Perennial weeds like this are renowned for regrowing as soon as you get rid of them. They bury their roots so deep that even pulling them from the ground won’t stop them from growing back. It’s important that you dig deep and get rid of every last bit of the root, if you want to stop this weed from growing back. Also known as a compass plant, this weed is certainly not as edible as iceberg lettuce unfortunately. Common in the South East of England and all over America, the prickly lettuce grows quickly and spreads even quicker. Just like with the dandelion this perennial weed will bury its roots deep, so you need to dig far into the ground to remove all of it. You can also use weed killer that works deep in the ground, but only if other plants are not nearby. In the 19th Century this plant was introduced into Britain for those who wanted something a bit more exotic in their garden. However, Japanese Knotwood soon spread fast and became a bit of a weed problem in gardens, roadsides and even through pavement cracks. There are certainly environment agency rules about removing this plant so it is best to get professional TP Japanese knotweed treatment instead of digging it up yourself. 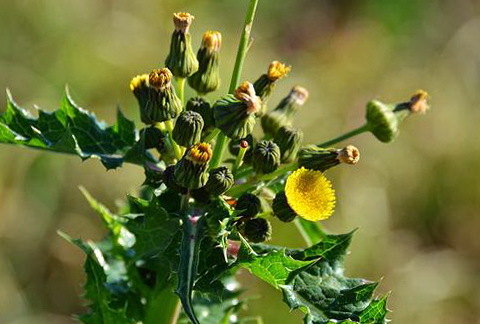 Although it disguises itself as fairly normal blades of grass, this clever little weed is actually extremely harmful to other plants and a pain to remove. The thin white roots can bury themselves deep into the ground and wrap themselves around the roots of your garden’s flowers. You’ll find it difficult to completely remove couchgrass from anything other than raised beds, so it may be time to get the herbicide out for this one. As the nettle goes to prove, not all weeds are bad news the whole time. However, letting your garden getting overgrown with any kind of weed will stifle your own plants and leave the yard looking messy. Make sure you keep your garden in good condition and de-weed whenever you get the chance.